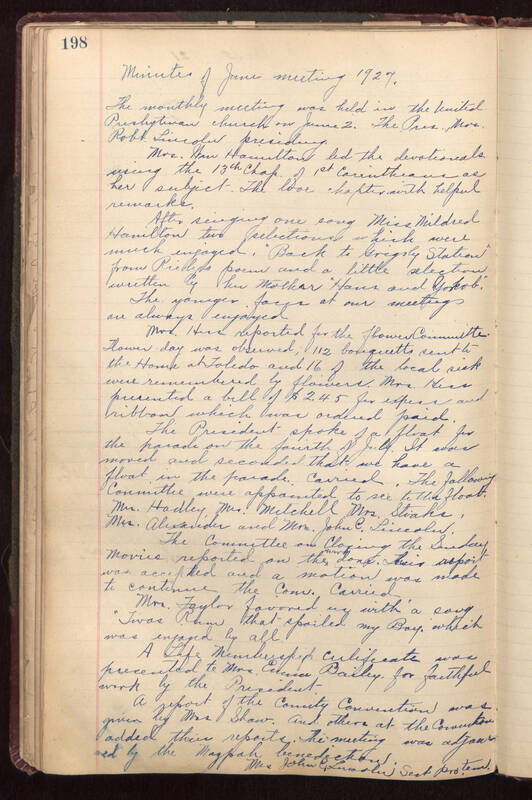 MInutes of June meeting 1927. The monthly meeting was held in the United Presbyterian Church on June 2. The Pres. Mrs. Robt. Lincoln presiding. Mrs. Ann Hamilton led the devotionals using the 13th Chap. of 1st Corinthians as her subject. The [illegible] chapter with helpful remarks. After singing one song Miss Mildred Hamilton two selections which were much enjoyed. "Back to [illegible] Station" from [illegible] poem and a little selection written by her Mother "[illegible] and Jacob" The younger faces at our meeting are always enjoyed Mrs Hess reported for the Flower committee. Flower day was observed; 112 bouquets sent the Home in Toledo and 16 of the local sick were remembered by flowers. Mrs. Hess presented a bill of $2.45 for [illegible] and ribbon which was ordered paid. The President spoke of a float for the parade on the fourth of July. It was moved and seconded that we have a float in the parade. Carried. The following Committee were appointed to see to the float. Mrs. Hadley, Mrs. Mitchell Mrs. Stacks, Mrs. Alexander and Mrs. John C. Lincoln. The Committee on Closing the Sunday Movies reported on the work done. This report was accepted and a motion was made to continue the Com. Carried. Mrs. Taylor favored us with a song "Twas Rum that spoiled my Boy" which was enjoyed by all. A Life Membership Certificate was presented to Mrs. [illegible] Bailey for faithful work by the President. A report of the County Convention was given by Mrs. Shaw. And others at the Convention added their reports. The meeting was adjourned by the [illegible] Benediction. Mrs. John Lincoln Sect Pro. Tem.